True confessions: the trip to Paris for the UNESCO Mobile Learning Week felt daunting and difficult. There were too many deadlines, too many reports to write, too many proposals to get off, and just generally too much to do. More importantly, I was tired, tired in my bones. I felt like I needed a beach holiday, not a conference in a city, no matter how interesting and iconic that city may be. Nonetheless, I was booked and I was going. I resolved to make the most of it… and (to try at the very least) to transcend my introvert tendencies, not hide in the bathrooms, and get out, converse and meet people! How lucky that I did. Many presentations and conversations struck a chord, inspiring the tired-and-slightly-jaded me and giving me a fresh sense of gratitude for so much that I take for granted. 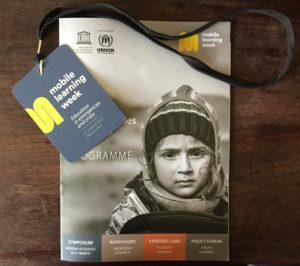 This year’s Mobile Learning Week was a partnership between UNESCO and the UNHCR, concentrating on the biggest humanitarian crisis of our times: refugees – and how to bring education to those affected by conflict, crises and emergencies. According to the UNHCR, we are experiencing the highest levels of displacement ever recorded. Their estimates reveal that in 2015, 24 people were forced to flee their homes every minute, while one out of every 113 people have been displaced due to conflict or persecution. A shocking 51% of the world’s refugees are children, many of whom are separated from their parents or care-givers. The mobile phone represents immense power and access to the world. A mobile device is one of the few possessions that someone fleeing their home takes with them. Mobile technology allows people – no matter what their circumstance – to access a wide range of educational and other services. The conference focused on these solutions and their impact and potential impact on displaced people’s worldwide. The themes were made even more poignant thanks to the number of Syrian refugees families I saw scattered across the city, many living – with their small children – on the streets of Paris. While I had read and knew about the refugee crisis and the influx of refugees to various cities in Europe, the reality of this was only brought home while walking around the city. It was a sad and emotive reminder of the fragility and potential impermanence of stability and order in our lives. Representing FunDza, I presented the projects that we’d run with the UNHCR over a three-year period (2014 to 2016) to commemorate World Refugee Day. In these we’d used a variety of specially-created stories to shine a light on the lives of refugees in our country. The intention was to deepen understanding of what it is like to be a refugee, and thereby promote tolerance and increase empathy. It was wonderful to revisit this work. Much of what we had learned through running these projects we have incorporated into our methodology for other projects that fall into our ‘fiction for social change’ realm, in particular our first Rights project and now our newly-launched Rights 2.0 – Bridging Divides project. In addition, one of the three over-riding themes in the latter is a focus on ‘Community Divides’. This will see us producing more stories focused on refugees, xenophobia and the stresses that displacement has both on those who are displaced and on those communities that must adapt to the new arrivals. In the session in which I presented, I was privileged to be exposed to a range of other exciting projects. Muy-Cheng Peich spoke about the Ideas Box, which is a multimedia toolkit that create learning centres for isolated or displaced communities. Deanna Del Vecchio of Rumie spoke about their solution to build a digital library for refugees. Jennifer Young of Pearson and Annya Crane of Worldreader talked about the Project Literacy-funded initiative Read to Kids, piloting in India, that seeks to empower parents to read to their children and to help them gain the necessary early literacy skills. Tanyella Evans, of Library for All, which has built a cloud-based digital library and platform that is filled with locally relevant e-books curated for different regions in the developing world. I was also asked to participate in the Global Digital Library workshop, hosted by Christer Gundersen of the Norwegian Digital Learning Arena and Tony Bloome of USAID, to speak about the merits (and drawbacks) of print versus digital. The workshop was highly participative and discussions touched on a range of issues such as localisation of content and the need for locally-created content, the need for content in a wide range of languages and the merits (and difficulties) of translations and/or ensuring quality. Deborah Backus of All Children Reading spoke about a project in Morocco that adapted EGRA (early grade reading assessment) for deaf/hard of hearing children in the country using Moroccan Sign Language. Find out more. Geoff Stead and Anna Lloyd of Cambridge University presented on how Cambridge English is trying to leverage it’s position as a ‘sharing’ and ‘connecting’ institution in order to promote English language acquisition. EduApp4Syria, sponsored and spearheaded by Norad, has launched two exciting literacy apps specifically to help Syrian children develop a familiarity with written Arabic through games. Check out the two games: Feed the Monster and Antura and the letters. NaTakallam, which connects refugees and language learners worldwide through skype tutorials and conversations, impressed me with its interesting social enterprise business model. War Child Holland’s ‘Can’t Wait to Learn’ project that is seeking new ways to scale in order to bring their early literacy and early numeracy programme to even more young children in need. 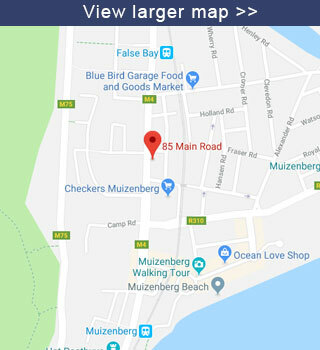 BluPoint.org, a solution to bringing quality content and services to areas that cannot easily connect to the internet through a hub that connects (at 4G+ speeds) to mobile devices through wifi, bluetooth or FM radio. Kiron Open Higher Education, an innovative approach to opening up higher educational opportunities to refugees in Europe through MOOCs and blended learning approaches. EVOKE Literacy, an All Children Reading: A Grand Challenge for Development (USAID, World Vision and the Australian Government) and Pearson’s Project Literacy project, that aims to empower young people to become change agents for literacy through a multi-player collaborative game. This will be piloting in South Africa in the coming months. It is definitely a project that interests us as it is aimed at our target readership (teens and young adults) and it uses a story-approach to set up the game. When I left Paris, spring had without doubt sprung! There were daffodils in abundance, and the chill in the air was dissipating. I, too, felt renewed by the many deep and interesting conversations I had had over the course of the week. It was wonderful to meet many people with shared passions for education and social development, and a desire for approaching problems with innovation and energy. Thanks goes to FunDza trustee, Steve Vosloo, now based at UNESCO in Paris, for accommodating me. This ensured that despite the fragility of our South African rand, I could participate in the conference and learn from those around me.